The difference between archetypes and stereotypes is subtle, but crucial. 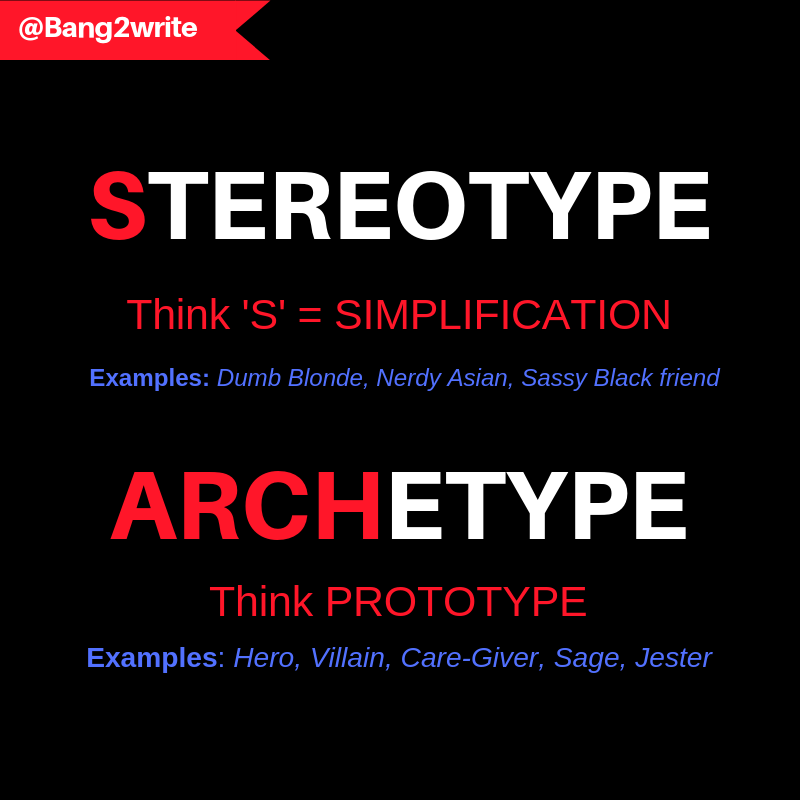 Archetypes are frequently mistaken for stereotypes and vice versa … Not just by writers, but audiences and critics too. This is never more obvious than with comedy. This genre sometimes DOES use stereotype for comedic effect, in shows like The Simpsons. Homer is ‘The American Dream gone wrong’. He is a cliché of white, middle-class male entitlement. It doesn’t matter how he screws up, he will fall on his feet (usually because someone else will clear up his mess). It is the point of his character and why we love him. So stereotypes are simplifications, not the whole story. Sometimes this is useful or even desirable, as outlined above. Other times, this simplification creates a short-cut to a character that is dated, boring or even offensive. In comparison, archetypes are a ‘typical example of a person or thing’. This means they are the foundations of a character, not the character itself. They are PROTOTYPES, not the finished article. Put simply, archetypes are a starting point for characters. 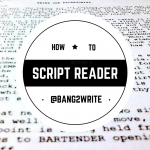 You may start with archetypes like hero or villain, but HOW you write them will differentiate them. For more on archetypes, CLICK HERE. It always makes me laugh when I hear writers posit the writing on Friends is ‘crap’ or even ‘bland’. It was – and remains – a beloved show for a very good reason. The hard fact for writers to swallow is, the writing on Friends MAKES characterisation look easy. Every member of the cast of characters on Friends makes use of archetypes. 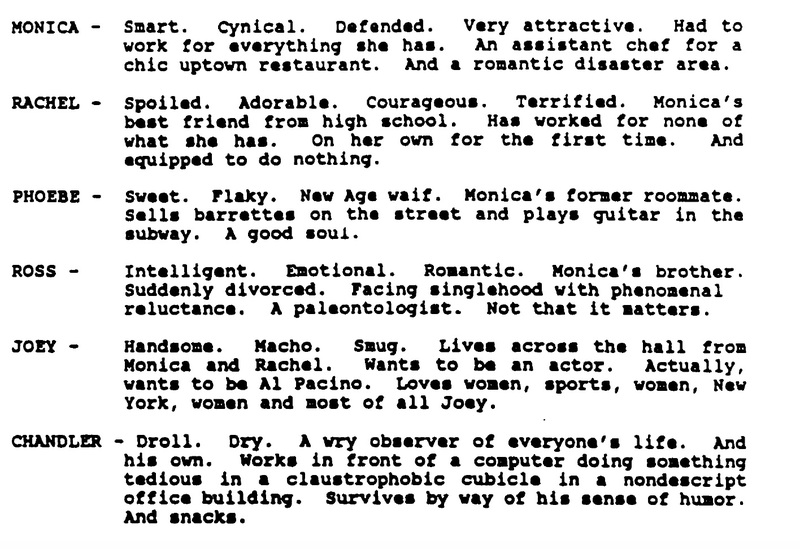 As you may recall from my previous post on the Friends pilot episode, the original character bios look like the below. What’s surprising to most people is how ‘dead-on’ the character bios are … and how they remained so, throughout the ten series and the decade the show was on the air. With these in mind then, I am going to reverse engineer each character down to her or his principal archetypes. Let’s go! It’s no accident Rachel works in fashion. Creators are inspired and artistic, with vision and imagination. She had only one thing she was good at – shopping! – and yet made a whole career out of it. She walked away from her old life; she had nothing when we met her … But by the time the show ends, she has a whole new life. Monica HAS to be in charge … It is not just a state of mind, it is her identity. Small or large, she has to have a say in it. This is all based on neuroses … She was the overlooked child at home; at school, she was the ‘fat friend’. So now she revels in her status as ‘the hostess’, or Ruler. Everyone has to revolve around her and she will do ANYTHING to ensure this is the case (mostly baking and food-related). Phoebe might be considered the original Manic Pixie Dream Girl, but the reality is she is far more than this. She has a stupendously dark back story, but far from a tragic figure, she is presented as a warrior. The little things that bother Monica and Rachel just don’t connect with her. She knows real life can go south at any moment, so instead does what SHE wants. She is not bound by societal norms and values. Ross is the star of his own mind-movie. He might be clever and accomplished, but holy crap does he know it! His self-importance and arrogance know no bounds. He was his parents’ little prince, so now he thinks he is a hero. This means he now thinks everyone should do what HE wants. He also thinks he knows everything … which he does NOT. When life fails to go his way then, he never reacts well. Chandler is outspoken and clever with it. Crucially though, being accomplished does not matter to him (at least until he finds his dream job). He speaks the truth constantly, nearly always to his own detriment … And often everyone else’s too. If he just let go of his neuroses – like Monica – he would be happier. Joey does what Joey wants, but in a crucially different way to Phoebe. He is a positive thinker like her though, nearly always able to see the bright side. He might be slow on the up-take, but once he gets there he will stay by your side. Unfortunately it takes ages for him to even notice, let alone get there (wherever that is!). If Rachel wasn’t so high on herself, she wouldn’t miss so much. Rachel has lead a life of privilege, which means she doesn’t always see what is right front of her face. Sometimes literally, such as the time she accuses her would-be Boss of trying to kiss her. (In reality, he was pointing to ink on her lip). She will also do pretty much anything to save face … Which in turn leads her into bigger problems. Monica, minus her neuroses, would enjoy better relationships with other people. Whether it is her friends, boyfriends or co-workers, Monica is in a constant battle to be liked. This also crosses over with her need to be ‘the best’. If she forgot about all this, she would be easier to be around and a better friend. Phoebe is so fiercely independent, she forgets other people care about her. Phoebe has always had to fend for herself, which means she can be an outlier in the group. She is almost a lone wolf to a fault! Also, if the group is in conflict, she will always defect to the winning side. If Ross actually thought about the impact of his behaviour and opinion on others, he would literally have a better life. He wouldn’t have got divorced so many times. Plus he would have been with Rachel throughout all the series. He would be closer to his son, Carol and Susan. In addition, he wouldn’t have lost his job at the museum. He wouldn’t have alienated Joey and Chandler when he moved in with them. And so the list goes on. Chandler has so many hang-ups, it’s no surprise he is a mess. He worries so much about his flaws and insecurities, he draws attention to them constantly. It’s no wonder people can see them, then! But this creates a vicious circle … Which in turn makes him both endearing AND annoying at the same time. 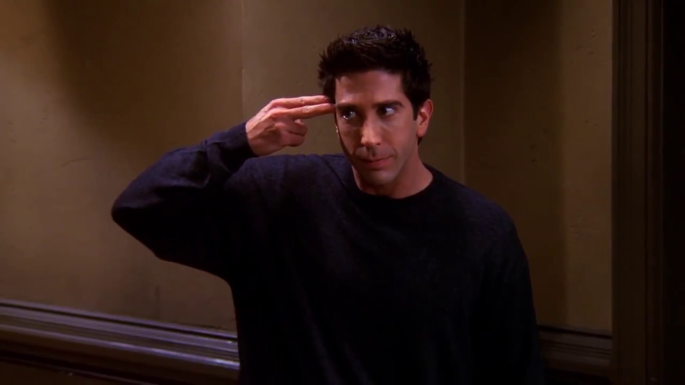 Like Ross, he is thinking mostly of himself. Joey is like the antithesis of both the other guys … he literally doesn’t care! But this ends up meaning he ends up with the same problem. He would have a better life if he thought less about himself and more about others. But of course … If the characters DID reject these things above there would be no comedy! This is why Friends’ characterisation is so good … It makes use of the archetypes available exceptionally well and builds on top of them effectively. As the headline says, it makes it look easy. 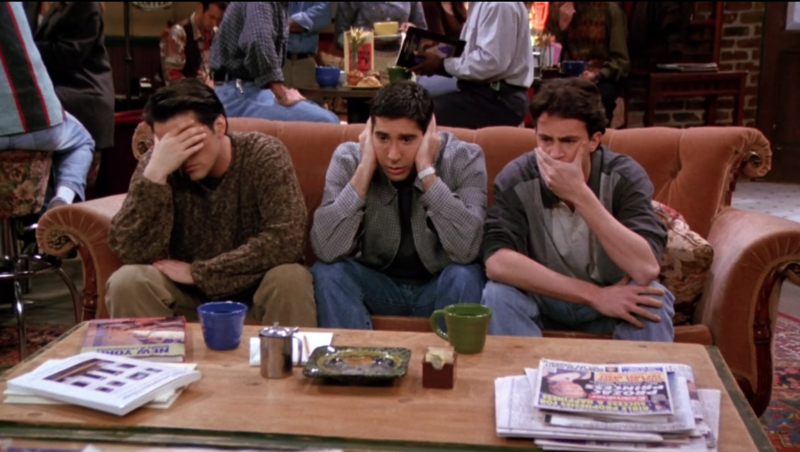 With the exception of cliffhangers, a lot of Friends was filmed in front of a live studio audience. This meant they frequently had guest stars as secondary characters who were popular at that time (and who still are, in some cases). Often these appearances are marked with the appreciative cat-calls and ‘wooooooohs!’ of said audience. Sometimes, these guests would appear for just one episode. 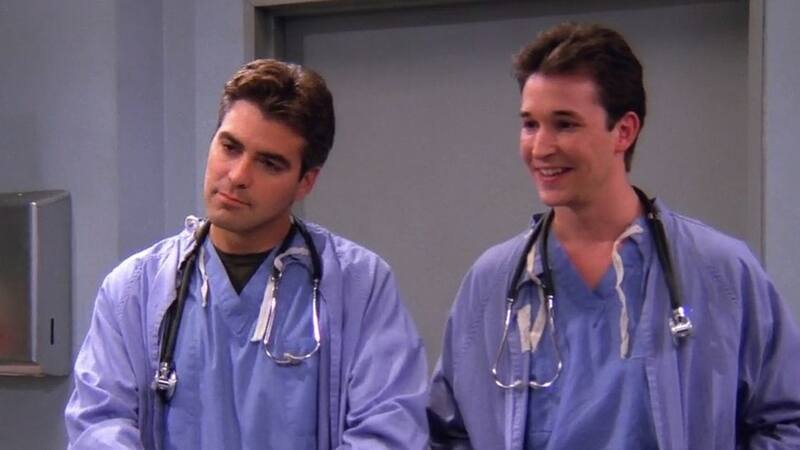 An obvious example of this would be the ER-Friends ‘crossover’ starring George Clooney and Noah Wylie. Though it was not quite the same, both actors reprised their roles as doctors *like* the ones they played back then in ER. The purpose was to present Clooney and Wylie as potential love interest archetypes. This might be an obvious choice, but in a series about friends looking for new relationships, it is authentic. Other times, an uber-famous star would appear in a secondary role, often to create a love interest for one of the group. Richard, played by Tom Selleck, was Monica’s on-off boyfriend for nine episodes, for example. Other times, these secondary characters played stars created a problem for one of the group … A kind of ‘antagonist of the week’. Will Colbett, played by Brad Pitt, appears in Thanksgiving Episode ‘The One With The Rumour’. (In this episode, it is revealed he hates Rachel and has since high school). Sometimes said stars are BOTH love interest and antagonist archetypes, such as ‘The One With The Jam’. In this episode, David Arquette stalks Phoebe’s twin Ursula and ends up going out with Phoebe. 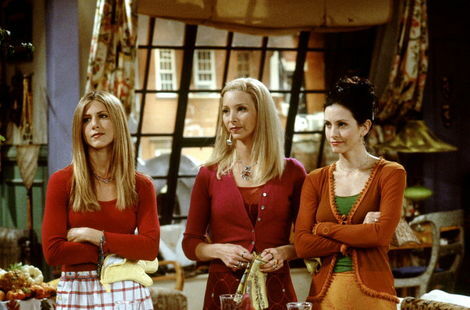 Who Is The ‘Real’ Main Character in Friends? By the way … As an ensemble, Friends is fairly unusual in that there is not a clear (aka ‘obvious’) lead character. This makes sense, because the show is principally about the friendship group as a whole. It is called Friends, after all! There were obvious elements that ‘stick out’ more – Ross and Rachel’s ‘will they, won’t they?’ relationship comes top. Another would be Chandler and Monica’s relationship. This means Phoebe and then Joey come somewhat ‘lower’ down the pecking order. We can get all this instinctively though, rather than sitting down and counting individual scenes. That said, being the internet, obviously someone sat down and worked out who the ‘real’ lead is! The answer? Surprisingly, it’s Ross … IF we count individual screen-time appearances. If we count mentions by other characters, it’s Rachel. You’re welcome! 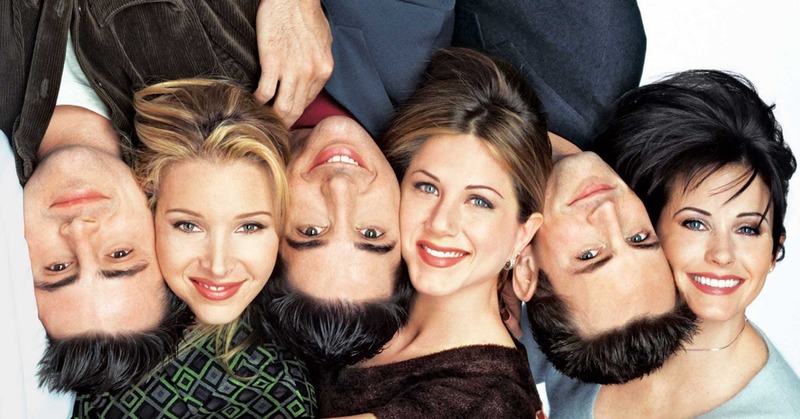 Whether you love or loathe the show, there’s plenty to learn here … Friends lasted ten series and a whopping 236 episodes. Read my previous case study on Friends’ pilot episode, HERE. Enjoy!